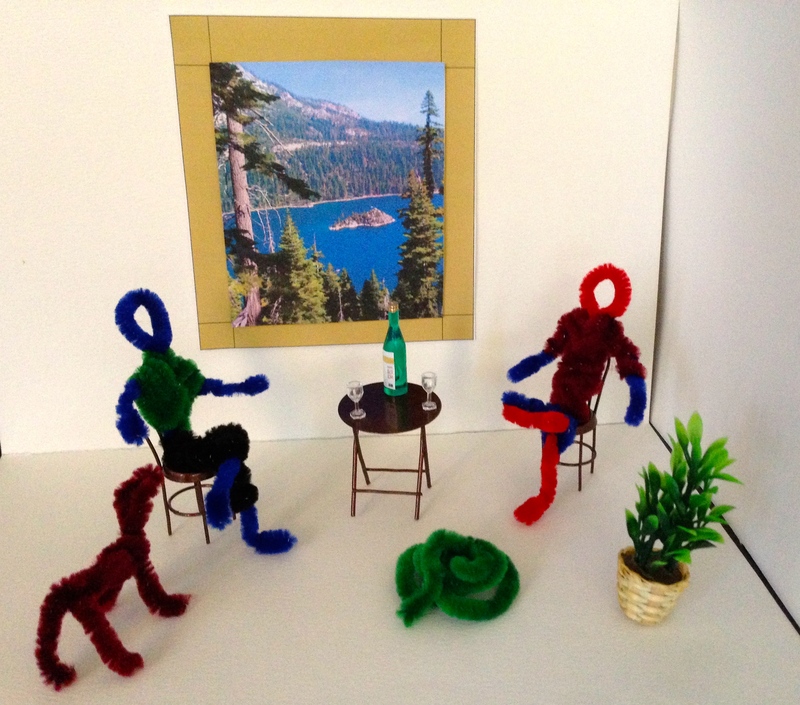 Occasionally, I make miniature people out of decorative pipe cleaners. Last week, I made a man and a woman. I gave them bodies, and heads, and limbs. I made clothes for them. (Sometimes I also make hair or hats; but, this time I didn’t.) I created pets for them: a dog named Ralph and a green snake named Snake. I designed a room for them to stay in. I gave the room a great view. I bought a little coffee table and two little chairs and a tiny decorative plant, so their environment would be pleasant. I gave them a miniature bottle of wine and two miniscule wine glasses to drink it from. I spent some time in their company every day. I would wake up, pour myself a cup of coffee, and go sit next to the little tableau for a few minutes. Watching them enjoy their peaceful, orderly, content lives set a positive mood for the rest of the day. It signaled that everything was as it should be. Not only in the display, but in the outside world as well. But, as I sat down this morning, I didn’t find tranquility. Instead, I heard them bitching and moaning and complaining. Like, they were bored and had nothing to do. Their lives felt empty. They couldn’t be expected to just sit there and drink wine 24/7! They needed variety. They needed adventure! They needed meaning! They wanted to be happy! And on and on and on. They had no clue that I could hear them. Actually, they had no idea that there was such a thing as me.